UCLA Health is among a small group of institutions awarded a total of $6.6 million in federal funding to support the development of promising medical devices for children's health needs. A network known as the West Coast Consortium for Technology and Innovation in Pediatrics (CTIP) received the five-year award from the U.S. Food and Drug Administration’s Office of Orphan Product Development. As a funded academic partner in the consortium, UCLA Health is one of three institutions within the network that will receive federal funding. Among its many roles, CTIP provides seed grants to innovators developing technologies that improve health care and treatment of pediatric patients with varied medical needs. Some recent projects include a low-cost infant microbiome-monitoring device, an exoskeleton to help treat orthopedic fractures, an improved sound-delivery vest for treating respiratory conditions, and a virtual reality system for pediatric chronic pain. UCLA Health's involvement in CTIP stems from a concerted effort by the institution to promote innovation in the field of health care. UCLA Health and the David Geffen School of Medicine at UCLA are engaged in many of the world's most advanced medical treatments and leading clinical trials. 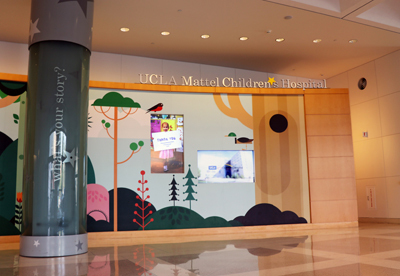 In 2018, Parents magazine named UCLA Mattel Children's Hospital to its list of the 20 most innovative children's hospitals in the country. "UCLA Health has the tremendous opportunity to deliver innovative medical advancements to children who need them," said Johnese Spisso, president of UCLA Health and CEO of UCLA Hospital System, including UCLA Mattel Children’s Hospital. "We are proud to be a pioneer in developing technologies to meet the needs of children." UCLA Health will help to identify and support innovations with proven medical benefits for pediatric patients – and ultimately bring those devices to market. Desert Horse-Grant, senior director of UCLA Health research and innovation, and Dr. Daniel Levi, an interventional pediatric cardiologist at UCLA Mattel Children's Hospital, will serve as voting members on CTIP's steering committee, the group that reviews and selects project proposals. "The field of children's health has huge potential for innovations to transform patient care," said Horse-Grant. "We're eager with the FDA's help to move breakthrough technologies from concept to everyday clinical use, where they change the lives of children." Levi added: "This consortium allows us to work together with Children's Hospital Los Angeles and the West Coast CTIP team to fund efforts to develop important devices for children. The funding is mandated to go to top projects nationally, regardless of institution affiliation. Thus, we will market to companies and entrepreneurs in the community developing pediatric devices." CTIP network members include UCLA; Oregon Health & Science University; University of Southern California; Children's Hospital Los Angeles; UC San Diego; UC Berkeley; Seattle Children’s Hospital; Cedars-Sinai Accelerator; LA BioMed; and Project Zygote. To learn more about innovation at UCLA Health, visit the website.